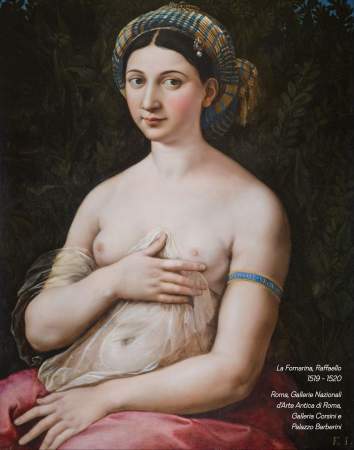 The exhibition begins with an investigation of Raphael’s cultural roots in Urbino, Perugia and Siena. In the sophisticated Court of Montefeltro in Urbino, the artist absorbed and made his own the ideas that came both from his colleagues and from antiquity, in a highly personal style of the very highest quality. The climate of the court can be seen in the works of his father Giovanni Santi, and in those of Pedro Berruguete, Perugino and Pinturicchio, which are compared with no fewer than twelve paintings by Raphael from museums in Italy and abroad. The fascinating subject of Raphael’s success in the nineteenth century is examined in the second part of the exhibition. The arrival of the Saint Sebastian in the collection of Guglielmo Lochis in 1836 coincided with a renewal of interest in Raphael’s personal life and artistic career: on the one hand, there was the finding of his mortal remains in the Pantheon in 1833, and on the other a renewed interest in the mysterious Fornarina. Around this masterpiece, the works of Anthon Raphael Mengs, Peter Cornelius, Felice Schiavoni, and others show how the legend of the artist took hold in the nineteenth century. Every day, from 9.30 a.m. to 7 p.m. (ticket office closes at 6 p.m).